Membership payments are the lifeblood of our club: like most rugby clubs, we are a non-profit-making organisation and we rely on income from memberships, sponsorship, and bar/events to keep the club alive and functional. All the money we receive is spent on running the club, and keeping children and adults playing, watching and experiencing rugby in as many ways as we can provide. Apart from all the costs of running the clubhouse (just like your home, only much more expensive!!) we also need to keep our 130 volunteers DBS checked, trained in coaching and first aid, hire the pitches from the Council (they do not belong to us), pay for referees, pay for physio/First Aid provision, post-match food for children and adults.....the list goes on forever! We can’t thank you enough for investing in membership of the club: it is crucial for our continued successful operation. 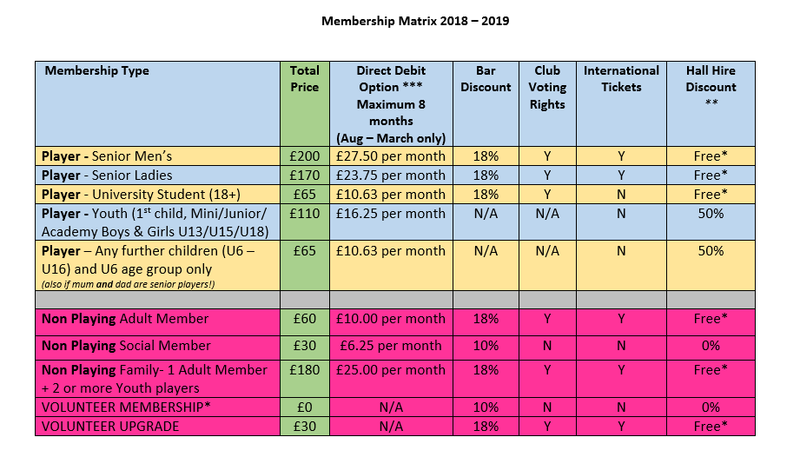 Membership fees can be paid through this website (click on the drop down under "membership information" tab above), via the RFU Game Management System (GMS), or via the club (at the bar). * VOLUNTEER MEMBERSHIPS: AVAILABLE FOR ALL WHO VOLUNTEER REGULARLY AT THE CLUB. Volunteer membership must be approved by the Committee and manually added by the membership secretary. Upgrades to full membership must be applied for via the membership form and will likewise be manually added. Ian has been a club member for many years & has kindly agreed to donate 20% of any commission he earns from a lead via the Club or a Club member to the Club. All initial consultations are free of charge. Present your BRFC membership card for a 10% discount. Martins Tool Hire fleet includes: Excavators, Breakers, Dumpers, Rotavators, Mixers, Generators, Lawnmowers, Carpet Cleaners, Nail Guns, Pressure Washers etc. 20% discount on Visitor Green Fees. BRFC members can receive a special rate for memberships on pool and gym. The normal rate is £41 per month, the special rate for club members is £25.99. this includes full access to the club at all times. Other benefits include discounts for beauty treatments and discounts in our restaurants (if they are gym/pool members). BRFC members can also have 10% discount of our ‘best available rate’ for accommodation. Please call us directly on 01256 796 795 quoting BRFC to book. BRFC members can also benefit from their facilities for meetings and events, For a quote please call them directly.